Dates are delicious little desserts manufactured and packaged very effectively by mother Nature. That dates are packed with nutrition is no new knowledge. Packed with micro nutrients and minerals, the sweetness of dates is so complex that eating just a couple of dates relishing them slowly gives you much more satisfaction than eating a whole wedge of cake. Dates are the best example of efficient calories as I say, each calorie carries essential Vitamins and minerals to nourish the body. Read about health benefits of dates here. I often use dates to sweeten desserts and make a laddu with dates and seeds or nuts, this time I wanted a fancier shape and decided to bake square bars of dates and nuts with a kunafe crust. I used thin vermicelli called sevaiyan instead of kunafe but it works really well as both are the same technically and using local products makes better sense. I bake another dessert with sevaiyan which is closer to savaiyon ka muzaffar and we love that recipe too. This time we had a family get together for Raksha Bandhan and since my dad is a diabetic I wanted to make something suitable for him. He does eat small servings of such desserts as the glycemic index is lower when table sugar is not used and there are enough nuts in the recipe. Moreover, serving such desserts to a get together is a great way to know whether everyone likes them or not. I had made 2 more desserts, one was the black sticky rice and mango pudding and the other was a traditional white rice kheer with loads of raisins and shredded coconut. So there was enough variety for everyone. I am glad everyone just loved these date and nut bars, of course we loved them too and I feel these are tasting better after 3-4 days (stored at room temperature). The recipe is easy but it takes a bit of time chopping the nuts and dates first (use a cleaver or a food processor) and then the other steps. But the time taken is well worth. You would need about an hour of dedicated time to bake these date and nut bars. 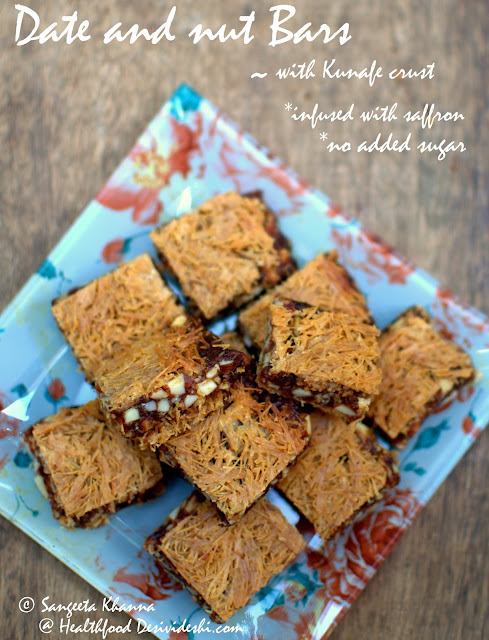 I have used raw nuts and I recommend strongly about using raw nuts for this recipe. The taste is just perfect for this kind of recipe which will be baked briefly to get the crust browned a bit. The nuts must be chopped and 'not powdered coarsely'. Chopping lends a bite to these bars, you can use a food processor with a chopping blade attachment. Add the 15 gm ghee and saffron to the dates, dump the chopped nuts too in the sticky mass and knead using your hands. The dates are soft enough to make a dough. Now gather this date and nut dough and roll into a flat square the size of your baking pan. You would need a silpat sheet to roll out this date dough or use a parchment paper as you have to transfer this sheet on the baking tray later. Now crush the vermicelli. Add the milk powder, 15 gm ghee and water (60 gm or just enough to make the vermicelli moist) and mix with your fingers well. 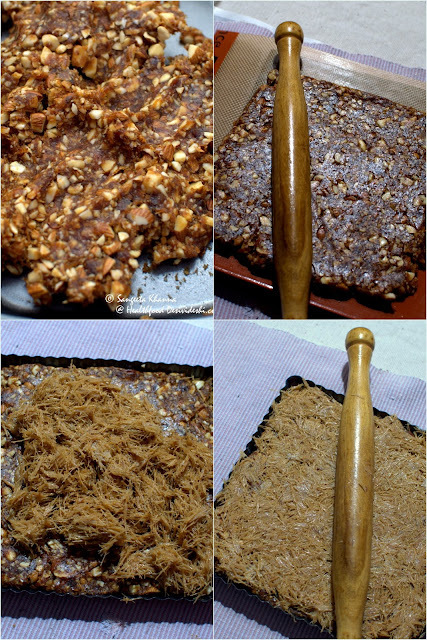 Spread half of this vermicelli mix on the base of the baking pan, now transfer the rolled out date and nut dough over the base and then cover it with the other half of the vermicelli mix. Roll out the surface once again to press down the layers using a greased rolling pin. Now bake at 170C for 20-25 minutes or till the vermicelli layer starts looking golden. Take it out of the oven and remove the rim of the tray if it is a loose bottom tray or invert the tray over a wooden board quickly. Cut into squares and let the bars cool down. Store in an airtight container. It stays well for 3-4 weeks at room temperature. 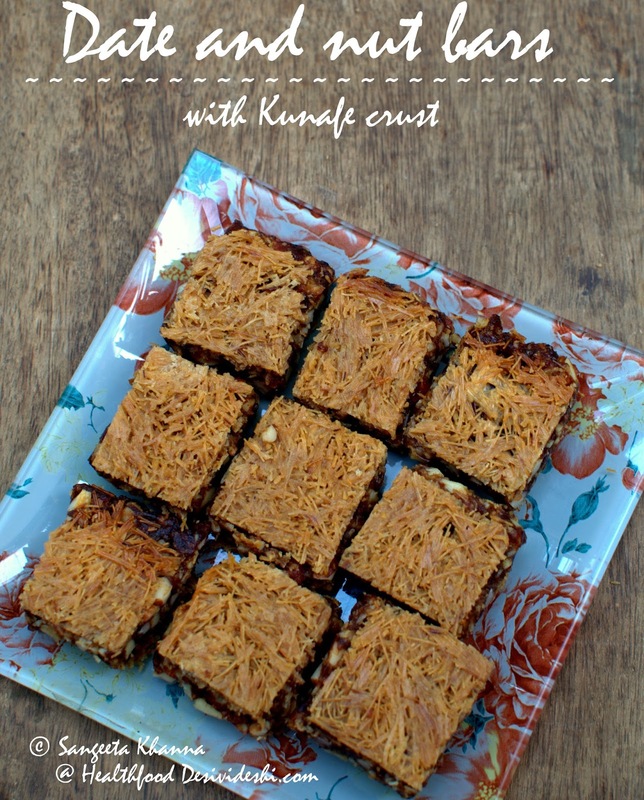 The taste of dates and nuts and the crunchy crust works really well for this dessert that is actually a finger snack too. Most Indian mithais are served like finger snacks and most of them are loaded with sugar. 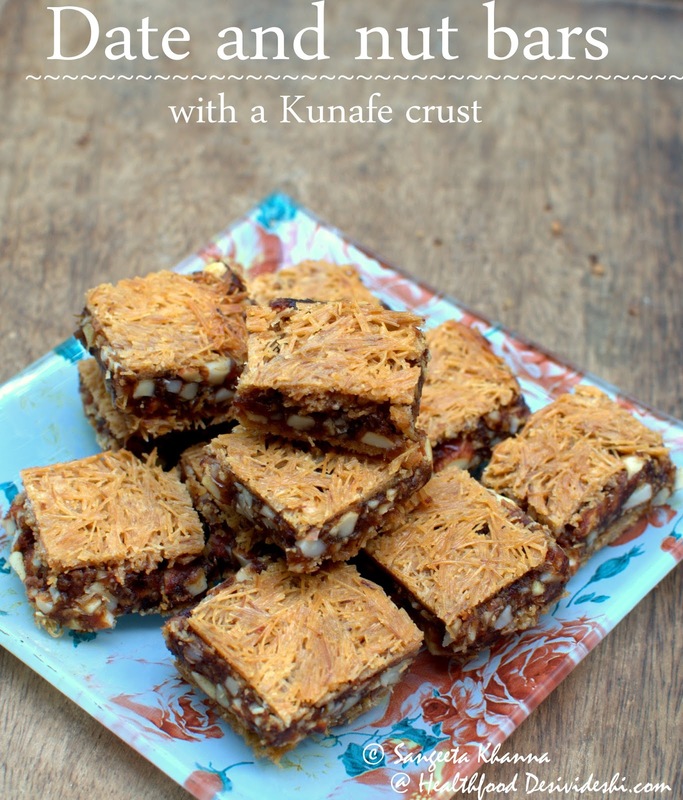 These dates and nuts bars can become one of those Indian yet healthy treats for family and friends, all the better because these can be stored just like our laddus and barfis. Trust me these bars are filling too, just have one with a glass of full fat milk in the morning and see how full you feel. Overall quite calorie efficient for a dessert. No I wont do the calorie count for them, but having a rough idea of the calories helps. If the calories consumed pack some nutrition it helps better. Try these dates and nuts bars with kunafe crust, trust me you will be baking them frequently.